is on your wish list now. Body Attack Flav Drops are extremely delicious and give your neutral protein shakes a special touch. ✔ Delivery time 1-3 working days within Germany. Here you get product information like ingredients, nutrition facts or allergy advices. *This file (PDF) can be opened with Adobe Reader, if not allready installed. Content is sufficient for use according to our recommendation for 200 day(s). 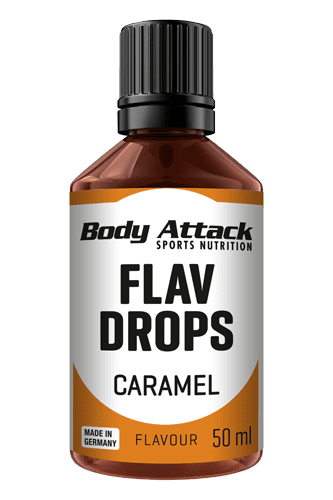 The Flav Drops by Body Attack are a tasty, highly concentrated flavouring system designed for refining food and beverages. The consumption of fitness and diet products can become rather monotonous over time. Flav Drops are ideal for boosting your taste buds. A neutral-flavour protein shake, for instance, is jazzed up in no time. And what is best: You can enjoy without regrets as the drops are free of calories and sugar and therefore ideal to use during diet and training phases. Many athletes regularly incorporate curds, yoghurt and milk in their diet to top up their protein level with protein of high biological quality. As you can´t get dairy products quite as sweet by adding only fresh fruit, lots of people use honey or syrups containing sugar. The regular intake of simple sugars can, however, lead to weight gain and promote the formation of fat. This makes the Flav Drops an ideal alternative as they taste wonderfully sweet and tickle your taste buds in a wide range of delicious flavours. You now have a good variety of different flavours at hand - bringing an end to the days of monotonous and boring food. Muesli and smoothie enthusiasts, too, will love the different flavours. Because Flav Drops conjure up more flavour in your food, no matter whether you want give your food a more intensive taste of chocolate muesli or strawberry smoothie, it is entirely up to you how many flavouring drops you add. And last but not least: let us not forget baked goods like cakes, muffins, pancakes, etc. which are often sweetened with sugar or honey. These also supply your body with too many simple sugars and empty calories. Body Attack Flav Drops contain sweeteners and flavourings which make the taste of food and beverages more intensive. It is important that both are represented in the ideal ratio to give the food a very intense taste. For whom are Body Attack Flav Drops suited? Thanks to the highly concentrated formula, only 5-10 drops are all you need to boost your shakes. The Flav Drops are ideal for touching up milk, shakes, yoghurt, desserts, diet products, coffee, tea, cake and gateaux. The Flav Drops are calorie- and sugar-free which makes them simply perfect for all figure and health conscious people. When used in the recommended quantity, the Body Attack Flav Drops supply your body with no calories which is why no nutrition information is provided on the label.